Types of Scientists Task Cards- Who am I? 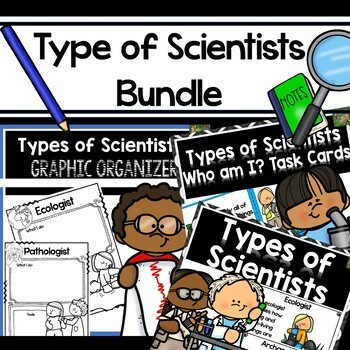 Your students will love to learn about 17 different types of scientists covered in this bundle! Please click on each individual product to learn more about what is included. Buy as a bundle and save! Check out my other science products for elementary students! Science Words for 2nd Grade-Great for word walls! Did you know you can earn credits for future TPT purchases? Please go to your My Purchases page. Next to each purchase you'll see a Provide Feedback button. Click that to be taken to a page where you can leave fair feedback. Feedback and followers are always appreciated! Click the green star at the top my page to know when I add new products and freebies!